I never knew a hot cup of green tea could actually give you a 'cooling' sensation in your mouth until I tried the 6X A.O. 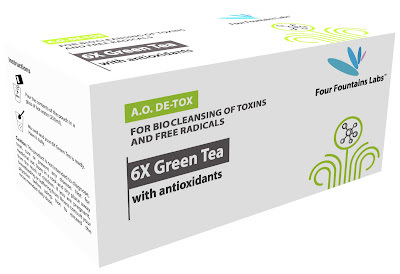 De-Tox Green Tea by Four Fountain Labs. There is surely a lot of science that goes behind formulating this green tea. It is in the form of a powder and not like the quintessential tea bags. So, all those who refrigerate their green tea bags to get rid of puffy eyes, here is a spoiler for you! The whole focus and positioning of this brand of Green Tea is on anti oxidants that help you detoxify your body. It comes in a pack of 30 sachets for Rs. 795 which is definitely on the higher side. But this green tea definitely gives you a shot of energy in a jiffy. Just mix the contents of one sachet with 250 ml of Hot Water and you're good to go. If you're a Citrus lover, then you will enjoy this one all the more with nuances of orange and lemon. Probably, they should have named the Green Tea better as it is now a lifestyle product. A name that sounds more appealing to the consumer rather than it sounding like supplement. These Super Green Tea Packs are available on Amazon India!